I've had these beautiful Hydrangea Stamps from Kitchen Sink Stamps for quite some time, and have inked them up only a few times...To tell you the truth, I didn't know if I'd ever get it right. I'm so glad I picked them up again, I'm happy with the way my card turned out. I finally figured out what my issue was - I was using an acrylic block that had Tack N Peel on one side, so I had a hard time seeing through the images to line them up. I created this card for the Kitchen Sink Challenge found here. I used my SU Color Wheel to help me pick out the coordinating colors - I needed 4 for the flower, 3 for the leaves and 2 for the Butterfly. Gotta love that Color Wheel! The sentiment is from Stampin' Up! 's Great Friend Set. WOW! This one's a hit! Love how the Cuttlebug gives it a subtle texture and adds so much to the card. True perfection in achieving tonal harmoney with the colors. At first glance, I could have sworn this was a photo! It's STUNNING, Lisa! You did a beautiful job...the horizontal Cuttlebug background is PERFECT and really offsets the lovely flower. TFS. Beautiful card Lisa, those images are so realistic looking. The hydrangea just pops right off the page! And the yellow on the butterfly makes a great contrast. You've done it again!!!!! It was so worth it though. It is beautiful and you know I've had those inky fingers myself. This is stunning Lisa! This was my first Kitchen Sink Stamp set too...and IMHO this is the hardest one to line up correctly. You did a beautiful job! What a gorgeous card, Lisa! Your color choices are perfect. Wow! Great job on this card. I love hydrangeas! Absolutely gorgeous, Lisa!! 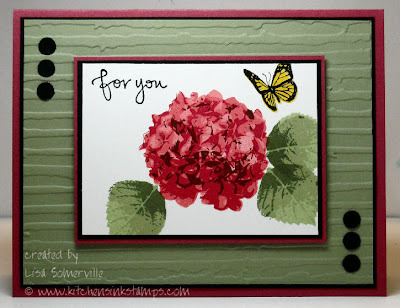 I'm so glad you pulled out your hydrangeas and created this stunning beauty for the challenge!! Thanks so much for playing along!! Oh my! This hydrangea is the prettiest one I've ever seen! The colors are absolutely gorgeous!! I'm so glad you didn't give up on the stamps! Your creation is gorgeous!! I love the colors you chose for the hydrangeas. Thanks for playing along with us! beautiful!! thanks so much for playing!